My name is Susan Guttridge, and I am a Master's degree Counsellor registered with the Canadian Counselling & Psychotherapy Association. 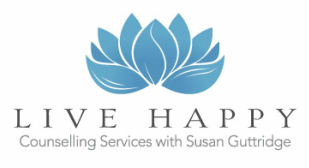 Live Happy is located in Vernon BC, in the beautiful Okanagan Valley. My expertise is trauma therapy (including sexual and emotional abuse, childhood abuse, and violence from a romantic partner), anxiety (including post-traumatic stress), traumatic loss, depression, and life transitions. I believe that as humans, we are capable of self-growth, healing, and experiencing happiness. I believe that often the journey towards healing needs to begin with developing affect regulation skills (the ability to gain control over those strong emotions that come on like tidal waves and seem to hijack our rational brain). Once an individual develops the ability to regulate emotion, healing trauma becomes more tolerable, and emotional suffering lessens. Contact me today, to start your journey towards emotional well-being. Why Choose a Canadian Certified Counsellor? The Canadian Counselling & Psychotherapy Association (CCPA) was established in 1986, with the goal to regulate the professional practice of Counsellors and Psychotherapists in Canada. Counsellors who have been certified by the CCPA, gain the title Canadian Certified Counsellor (CCC). This designation identifies to the public that the Counsellor is qualified to provide counselling services in Canada. The CCC designation recognizes that the Counsellor has obtained a high standard of professional preparation, education, and supervision requirements. Canadian Certified Counsellors are held accountable to their clients through the CCPA's Code of Ethics, Standards of Clinical Practice, continuing education, supervision requirements, and the Ethical Complaints Procedure. All Canadian Certified Counsellor's must pass a Criminal Records Check and carry professional liability insurance.